it's been open for about a month now, but luxasia held a formal launch this afternoon for the new guerlain counter at rustan's tower at shangri-la plaza. guerlain used to be distributed by rustan's commercial corporation, then disappeared from their stores for a few years. 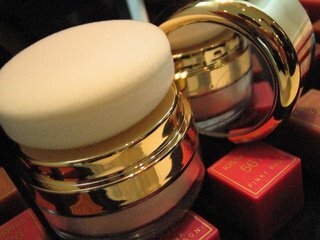 now it's back with a more elegant look and a very exclusive vibe (beauty junkies who hoard guerlain during trips abroad are not too happy that everyone can now share the joy!). gone are the trippy packaging and loopy fonts; in their place are sleek gold casing and a sophisticated script. they also carry the complete wardrobe of fragrances, including the honeycomb-like bottles of aqua allegoria. their best sellers are the pair of midnight secret (which you apply "before gimmick," according to the pretty boy behind the counter) and midnight star (which you apply after gimmick, "para the next day, fresh pa rin!"). but our favorite product has to be les voilettes matt touch voyage powder, this cute little jar with a mirror on the lid that contains powder and a pouf, which you just pat on your face for touch-ups. at P2550, it's a bargain, compared to those vials of midnight secret, which cost over 30,000 bucks! any guesses where the fash pack is? let's add some culture into our lives, shall we? where in the world is the fash pack?